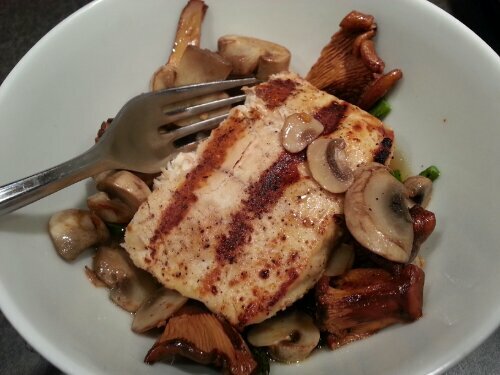 What happens when a friend gives you fresh halibut fillets, straight from Alaska? You make a good meal out of it. Really? I needed to answer that? This is a variation of a recipe that I learned in a Sir la Table cooking class that my wife and I took on Valentines Day a few years back. Using a few simple but powerful ingredients, the dish is a hearty, comforting meal that’s wonderful on a cool fall day. To make the jus, combine the stocks, and bring to a boil. 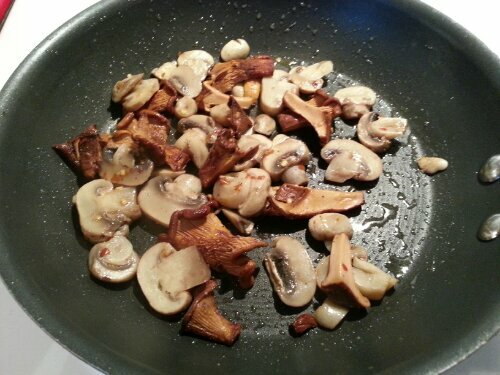 Reduce to a simmer, and add the mushrooms, a teaspoon of red pepper flakes, and a pinch of salt and pepper. Continue to simmer for 8-10 minutes. Strain the result through a sieve, separating the jus from the mushrooms. 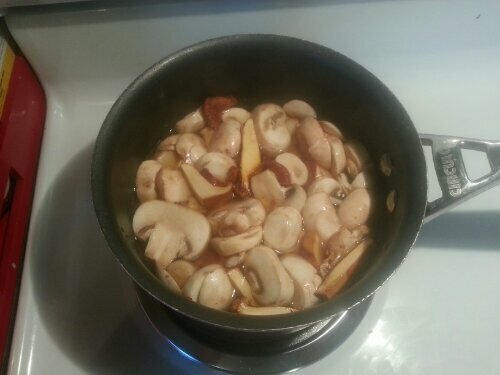 Just before serving, quickly pan-fry the mushrooms in olive oil to bring out the flavor, and give them a nice crisp texture. 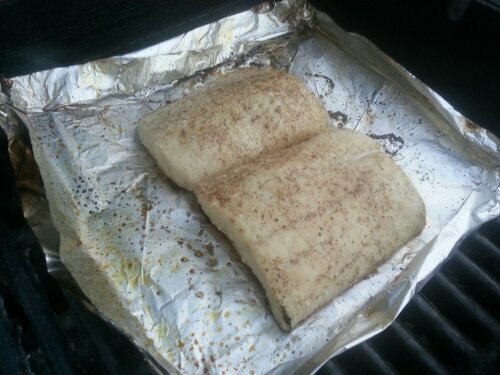 To make the halibut, pat the fillets dry, and coat generously with salt and pepper. Grill on tinfoil or oiled grates over high heat until flaky (about 3-4 min per side, depending on the thickness of the fish). Begin grilling the fish skin side down. 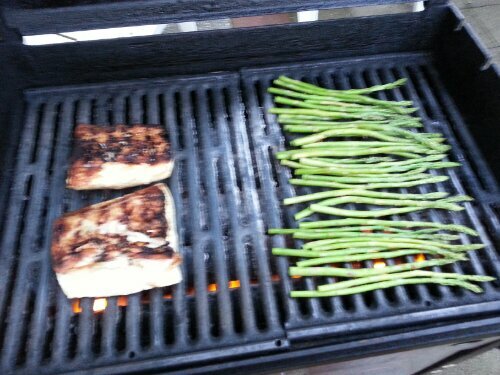 When you flip the fish, grill the asparagus for 3-4 minutes total, turning once. 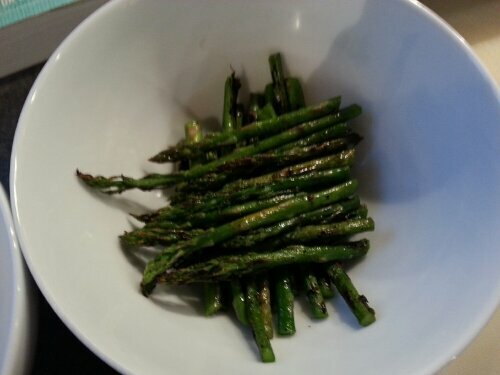 To plate, cut the asparagus in half, and cross the tops over the bottoms in a bowl to form a base for the fish. Place a fillet on top of the asparagus, spoon the (briefly) pan fried mushrooms around the sides, and finally pour the jus over the fillet until the amount rests evenly with the bottom of the meat. Though initially monochromatic, this beautifully simple dish has a surprising complexity of flavor, and is sure to please all but the pickiest of eaters… Unless the person hates fish, mushrooms, asparagus or any combination thereof. If that’s the case, then why are you cooking for them? Bring them out for fast food, they don’t deserve this meal anyway. Next Entry Minty-Lemon Past with Salmon? Yes please!